The blues was born in the Mississippi Delta, and since that fateful night in 1903 when W. C. Handy heard the mournful sound of a pocketknife sliding over the strings of an acoustic guitar and the plaintive song of a long-forgotten musician in the hot night of Tutwiler, Mississippi, the blues has been on a journey around the world. From the cotton fields and juke joints of the Delta, up Highway 61 to Memphis's Beale Street, St. Louis, the Southside of Chicago, England, and points beyond, the blues is America's unique form of music. Blues is incisive in its honesty, elemental in its rhythm, and powerful in its almost visceral sensation. Nearly every style of popular music has its roots in the blues. Muddy Waters said it best: "The blues had a baby, and they called it rock and roll." Memphis has become the heart of the blues world, with a re-born Beale Street acting as its spiritual center. People come from the world over to experience its beat, savor its emotion, and feel its power. In the end . . . "it ain't nothin' but the blues." 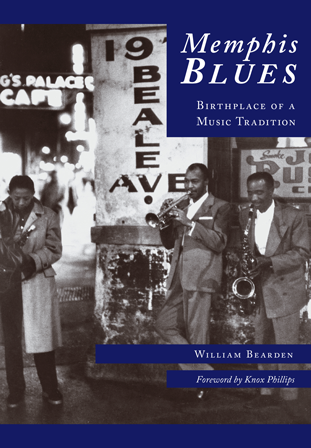 Memphis author and filmmaker William Bearden grew up in Rolling Fork, Mississippi, and has called Memphis home since 1971. He is the author of Images of America: Overton Park and Cotton: From Southern Fields to the Memphis Market. His documentary films include Elmwood Cemetery, Visualizing the Blues, Playing for a Piece of the Door, Masters of Florence, and Horn Island Journal.